With the cost of food rising, many people are looking for ways to save money on their meals. Coupons may seem like a good idea, but there are two fundamental flaws: They take time to collect and clip and you don't really save money unless you use the coupon on something you'd normally buy anyway. Since we rarely see coupons for staples like milk, produce and meats, it's hard to count on those saving us anything substantial. So, what can you do? When you know what you're going to eat, it's a lot easier to make your shopping list and stick to it. It's a good idea to plan your meals from payday to payday, so you're not stuck at the end of the pay period with no idea what to eat and little cash flow to work with. Sit down with a calendar and your local grocery store's sales paper. Considering the items you already have on hand, the items you need to restock, and what the store has on special this week, come up with meals you'd like to prepare. If you need some inspiration, search for recipes online. Make your grocery list recipe by recipe. Add other items you know you need. 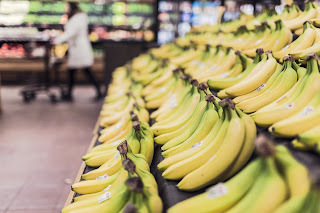 Buying in bulk is always a great way to save, but when you consider the fact that warehouse clubs like Sam's Club and Costco have annual membership fees, it's not always the most practical way to go. If you can't accompany a member as a guest, you can still apply the bulk principle to many things in your local grocery store. Go back to your store sales paper. See an item you use often on sale this week? Buy as much as you can afford while it's on sale. This is a great way to stock up on essentials like canned goods. While most of your grocery store's specials will be advertised in the weekly sales paper, there are often unadvertised discounts hiding throughout the store. This is particularly important in the meat and produce departments, as food could be on the verge of spoiling. These items are reduced in an effort to sell them quickly. As long as you cook or freeze the meat soon after you buy it, you'll be fine. The key with quick-sale produce is to only buy what you'll be able to use within a day or two. Sell By: This date tells the store when to stop displaying it. It refers to freshness, rather than spoilage. Grab from the back to ensure you get the freshest products, or opt for one close to the date to get savings. Best By (or Before): This date refers to product quality, not safety. Sour cream, for example, is already sour when you buy it, but tastes best when it's freshly soured. Guaranteed Fresh: Typically used for baked goods, these items will still be safe to eat after the date on the package, but won't be as fresh. Use By: This date is determined by the manufacturer as the last possible date for peak quality. Most products are still safe to eat after this date. Don't be afraid to shop multiple stores to get the best deals. If the stores are too far apart, though, you risk spending more money on gas to get there and back than it is worth. If there are other stores near your work or school that are on the way home, check those out when they're not out of the way instead of making a special trip just to shop. By Lucinda Watrous Copyright 2016 brass Media, Inc.